Definition of Herbal Remedies for What are Herbal Remedies? Herbal Remedies are natural plant substances used to treat and prevent illness and aid the healing process. 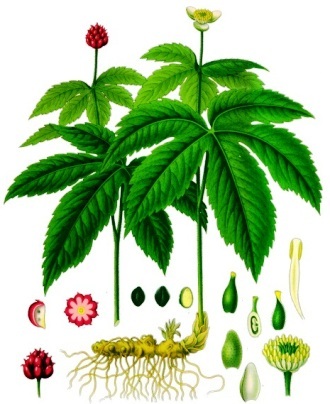 In medicinal use any of the parts of natural plants might be considered "herbs", including the leaves, roots, flowers, seeds, seed pots, resin, berries, root bark, inner bark and cambium (the green growth layer just next to the bark) or other parts of the plant. The Native Americans believed that natural herbs affect the spirit or soul of the person. Spiritual Healing, which includes the use of natural Herbal Remedies, is undertaken by the Shaman or Medicine Man and is based on the beliefs and healing practices of Native Americans. This type of healing combines elements of spirituality, ceremonies and rituals using natural Herbal Remedies for healing and cleansing. For additional information refer to the Preparation and Application of Herbal Medicinal Plants. Natural herbs and herbal remedies and treatments have long been used as the basis of traditional Native American herbal medicine. The Medicine Man needed to know the properties of Herbal Remedies, how they should be prepared and the quantities that were safe to administer. Herbal Remedies can be used in many ways, using different parts of the plant for healing. Some of the Herbal Remedies used were toxic or poisonous but were not dangerous if the correct quantities were taken. Different remedies and medicines are created from the leaves, flowers, juice, berries, nuts, bark, rootstock and roots to make powders, poultices, essential oils, ointments, tinctures, salves and teas. CAUTION: The following Chart of Medicinal Herbal Remedies is provided for information only. The preparation methods of each herb and the correct quantities must be measured before administering any Herbal Remedies. DISCLAIMER: We make no medical claims, nor intend to diagnose, treat, or heal medical conditions. Women who are pregnant or nursing, or persons with known medical conditions should consult their physician before taking any herbal products. Medicinal Herbal Remedies for Acne, Anxiety, Arthritis, Asthma, Backache, Blood Pressure, Bronchitis, Burns, Cold Sores, Colds, Colic, Constipation, Coughs, Depression, Dermatitis, Diabetes, Diarrhea, Digestive Disorders, Dysentery, Ear infection, Eczema, Eyes, Fever, Gas, Gout, Headache, Heart and Blood, Heartburn, Inflammations and Swellings, Influenza, Insect Bites and Stings, Insomnia, Kidneys, Liver, Menopause, Migraine, Nausea, Piles, Rheumatism, Sedatives, Skin, Sleep, Sore Throat, Stomach, Stress, Sweating, Tinnitus, Toothache, Water Retention and Wounds. The of Herbal Remedies and how they should be used during spiritual experiences and the healing process. Over 2000 medicinal plants were used in the preparation of Herbal Remedies that the Medicine Man, or Shaman, needed to identify in order for him to become an expert in the knowledge of medicinal herbs. The Shaman spent his whole life identifying and collecting such plants and Herbal Remedies. Natural Herbal Remedies were created using the medicinal properties of trees, ferns, grasses, shrubs, flowers, nuts, berries, vines and forbs (a broad-leaved herb other than a grass, found growing in prairies, fields and meadows. Medicinal Herbal Remedies are prepared in several different ways as each of the herbs release its healing powers in specific forms. Methods in the preparation of Herbal Remedies included making infusions (hot teas), decoctions (boiled teas), tinctures (using alcohol and water extracts), macerations (cold soaking) in order to make powders, ointments, poultices, and salves. The Medicine Man required his knowledge and skills to create Herbal Remedies for the vast variety of ailments treated by modern doctors. The following Chart of Herbal Remedies provide details of the names of common herbs and plants used by the Shaman as medicinal Herbal Remedies and healing aids to treat the illnesses, sickness and disease experienced by tribe members. Before administering any herbal remedies it is essential to understand the properties of each of the herbs used in Medicinal Herbal Remedies, how they should be prepared and the quantities of herbs that are safe to administer. Herbal Remedies can be used in many ways, using different parts of the plant for healing. Some Herbal Remedies use toxic or poisonous herbs, but they are not dangerous if the correct quantities are taken. CAUTION: The above Chart of Medicinal Herbs and Remedies is provided for information only. The preparation methods of each herb and the correct quantities must be measured before administering any Herbal Remedies. Medicinal Herbs for Remedies for Acne, Anxiety, Arthritis, Asthma, Backache, Blood Pressure, Bronchitis, Burns, Cold Sores, Colds, Colic, Constipation, Coughs, Depression, Dermatitis, Diabetes, Diarrhea, Digestive Disorders, Dysentery, Ear infection, Eczema, Eyes, Fever, Gas, Gout, Headache, Heart and Blood, Heartburn, Inflammations and Swellings, Influenza, Insect Bites and Stings, Insomnia, Kidneys, Liver, Menopause, Migraine, Nausea, Piles, Rheumatism, Sedatives, Skin, Sleep, Sore Throat, Stomach, Stress, Sweating, Tinnitus, Toothache, Water Retention and Wounds.